The Santos Lab moved to Toronto! After 15 years at UCSF, our lab moved to the Lunenfeld-Tanenbaum Research Institute and the University of Toronto, Canada, in the Summer of 2018. Miguel is Senior Investigator at the LTRI, Professor in the Department of Molecular Genetics at the University of Toronto, and Canada 150 Research Chair in Developmental Epigenetics. He will be leading an exciting new opportunity in this field in Toronto. We are looking for talented graduate students, postdocs and research associates. Miguel is also leading a search for a new Investigator/Assistant Professor in Developmental and Stem Cell Epigenetics. This website is not updated and is for informational purposes only. Please visit our new lab website at mrsantoslab.org. Pluripotency is the remarkable ability that certain stem cells have of giving rise to all cell types of the body. The molecular regulation of pluripotency is a fundamental basic biology question with important potential implications in Regenerative Medicine, Reproductive Biology and Cancer. 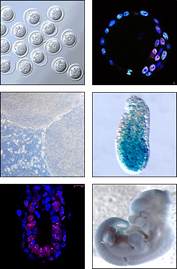 We are investigating how the chromatin state and the transcriptional program for pluripotency are maintained in pluripotent stem cells and how they can be revived during reprogramming, in both mouse and human cells. We study the epigenetic regulation of stem cell pluripotency in vivo using mouse models, focusing on early embryonic development and the germline. We use approaches from mouse genetics and embryology, stem cell biology, reprogramming, functional genomics, epigenetics and bioinformatics.